Beginning with the death of David and the rise of Solomon, 1 Kings charts the history of Israel through the divided monarchy, when Ahab reigned in the north and Jehoshaphat reigned in the south. This new translation, with introduction and commentary by biblical scholar Mordechai Cogan, is part of the Anchor Bible Commentary series, viewed by many as the definitive commentaries for use in both Christian and Jewish scholarship and worship. 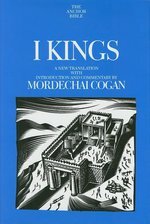 Cogan's translation brings new immediacy to well-known passages, such as Solomon's famously wise judgment when asked by two prostitutes to decide their dispute regarding motherhood of a child: "Cut the live son in two! And give half to one and half to the other." With a bibliography that runs to almost a thousand articles and books, Cogan's commentary demonstrates his mastery of the political history described by 1 Kings, as well as the themes of moral and religious failure that eventually led to Israel's defeat and exile. 1 Kings is a continuation of a narrative of the history of Israel which begins in 1 Samuel and continues through into 1 & 2 Kings. While we so often struggle with the events and issues of the book of 1st Kings, Ralph Davis helps us to see how it we can apply to the contemporary settings of the 21st century. As usual Ralph Davis uses pastoral application and laces it with his own sense of humour. He is noted for tackling scholarship head on. The book of 1 Kings outlines the rise and fall of ancient Israel through the stories of fourteen kings. It is a book of great victories and devastating failures. In its pages are violence, betrayal, power, and politics. But no matter how great the accomplishments or evil the deeds, none of these kingdoms built by human kings could last. John Woodhouse walks us through this book passage by passage as it reveals how God's purpose for the kings reaches far beyond what they could accomplish in their lifetimes. Their lives are part of a greater story, bearing witness about the King of kings, Jesus Christ, the Savior of the world--building and strengthening our faith as we set our eyes on the kingdom that will last forever. Dynasties, fractured kingdoms, prophecies of coming hardships - the book of 1 Kings is a grand, sweeping narrative of the beginning of the downfall of God's people. First Kings is not so much a book of history as a book of religion, says Dr. Simon J. DeVries. Through the historic events it relates, the religion of the Hebrew people was being shaped. Dr. DeVries s thorough overview of the world of 1 Kings its geography, its culture, its politics, and the religious situation brings the biblical record alive in its time and place. Upon this foundation is superimposed a comprehensive, lucid discussion of sacred history as theological testimony, and responsible consideration of 1 Kings as literary composition. 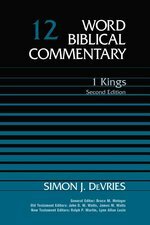 In this commentary, Dr. DeVries provides keen insight into the intricacies of both the events and the textual difficulties of 1 Kings: The throne succession from David to Solomon Solomon s reign his influence and his failings The building of the Jerusalem temple and its significance The division of the United Kingdom The puzzling chronology of the Hebrew kings The problem of heathen shrines and cult objects The role of the prophets in Elijah s time. For this second edition, he has updated and expanded the bibliography. Prophecy, a burgeoning new religious impulse of the period of 1 Kings, receives special emphasis as a particularly rich source of profound theological truth communicated in the effective linguistic forms of prophet-narratives. Whether appearing as historiography or as pious story, the contents of 1 Kings offer themselves as testimonies to the ways of God with men, Dr. DeVries notes. The scene is history; the players are kings and prophets; behind the curtain is the Lord of history, challenging his players to make history the scene of salvific revelation. " 1 KINGS-JOB EBC V4 OSI! The Gold Medallion Award-winning Expositor s Bible Commentary is a major contribution to the study and understanding of the Scriptures. Providing pastors and Bible students with a comprehensive and scholarly tool for the exposition of the Scriptures and the teaching and proclamation of their message, this twelve-volume reference work has become a staple of seminary and college libraries and pastors studies worldwide. The seventy-eight contributors come from the United States, Canada, England, Scotland, Australia, and New Zealand, and from many denominations, including Anglican, Baptist, Brethren, Methodist, Nazarene, Presbyterian, and Reformed. They represent the best in evangelical scholarship committed to the divine inspiration, complete trustworthiness, and full authority of the Bible. 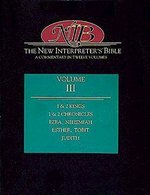 The Expositor s Bible Commentary uses the New International Version for its English text, but also refers freely to other translations and to the original languages. Each book of the Bible has, in addition to its exposition, an introduction, outline, and bibliography. Notes on textual questions and special problems are correlated with the expository units; transliteration and translation of Semitic and Greek words make the more technical notes accessible to readers unacquainted with the biblical languages. In matters where marked differences of opinion exist, commentators, while stating their own convictions, deal fairly and irenically with opposing views. VOLUMES AND CONTRIBUTORS Volume 1 Introductory Articles: General, Old Testament, New Testament Volume 2 Genesis: John H. Sailhamer Exodus: Walter C. Kaiser Jr. Leviticus: R. Laird Harris Numbers: Ronald B. Allen Volume 3 Deuteronomy: Earl S. Kalland Joshua: Donald H. Madvig Judges: Herbert Wolf Ruth: F. B. Huey Jr. 1, 2 Samuel: Ronald F. Youngblood Volume 4 1, 2 Kings: Richard D. Patterson and Hermann J. Austel 1, 2 Chronicles: J. Barton Payne Ezra, Nehemiah: Edwin Yamauchi Esther: F. B. Huey Jr. Job: Elmer B. Smick Volume 5 Psalms: Willem A. VanGemeren Proverbs: Allen P. Ross Ecclesiastes: J. Stafford Wright Song of Songs: Dennis F. Kinlaw Volume 6 Isaiah: Geoffrey W. Grogan Jeremiah: Charles L. Feinberg Lamentations: H. L. Ellison Ezekiel: Ralph H. Alexander Volume 7 Daniel: Gleason L. Archer Jr. Hosea: Leon J. Wood Joel: Richard D. Patterson Amos: Thomas E. McComiskey Obadiah: Carl E. Armerding Jonah: H. L. Ellison Micah: Thomas E. McComiskey Nahum, Habakkuk: Carl E. Armerding Zephaniah: Larry Walker Haggai: Robert L. Alden Zechariah: Kenneth L. Barker Malachi: Robert L. Alden Volume 8 Matthew: D. A. Carson Mark: Walter W. Wessel Luke: Walter L. Liefeld Volume 9 John: Merrill C. Tenney Acts: Richard N. Longenecker Volume 10 Romans: Everett F. Harrison 1 Corinthians: W. Harold Mare 2 Corinthians: Murray J. Harris Galatians: James Montgomery Boice Volume 11 Ephesians: A. Skevington Wood Philippians: Homer A. Kent Jr. Colossians: Curtis Vaughan 1, 2 Thessalonians: Robert L. Thomas 1, 2 Timothy: Ralph Earle Titus: D. Edmond Hiebert Philemon: Arthur A. Rupprecht Volume 12 Hebrews: Leon Morris James: Donald W. Burdick 1, 2 Peter: Edwin A Blum 1,2, 3 John: Glenn W. Barker Jude: Edwin A. Blum Revelation: Alan F. Johnson"
The significance of the First Letter of Peter for the formation of Christianity stands in sharp contrast to its brevity. John H. Elliott, a leading authority on this letter, brings its significance to life in this magnificent addition to the renowned Anchor Bible Commentaries. Elliott sets the letter into context, covering its literary, historical, theological, and linguistic elements. In detailed, accessible discussions, he draws on the latest research to illuminate the social and cultural influences on the Church in its initial years. Treating such important Petrine concerns as living honorably in a hostile society, finding meaning in suffering, and resisting social assimilation as the elect and holy family of God, the translation, notes, and commentary in this volume will help readers appreciate the powerful and enduring message of this fascinating letter. In this newest addition to the acclaimed BECNT series, respected New Testament scholar Karen H. Jobes provides a fresh commentary on 1 Peter. 1 Peter admirably achieves the dual aims of the BECNT series--it is academically sophisticated as well as pastorally sensitive and accessible. 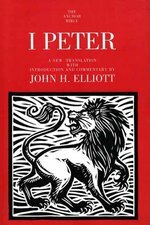 This volume features Jobes's own translation of the Greek text and detailed interaction with the meaning of the text, emphasizing the need to read 1 Peter in light of its cultural background. Jobes's commentary will help pastors, students, and teachers better understand the Christian's role as a "foreigner" in contemporary society.